As a relatively simple procedure, earlobe repair surgery is one of the most routinely performed surgeries at Medisculpt™. The primary purpose of this procedure is to fix a patient’s stretched or torn earlobes. Younger patients who have either deliberately stretched their earlobes or have accidentally torn one or both earlobes. Older patients with floppy earlobes due to age-related reasons. 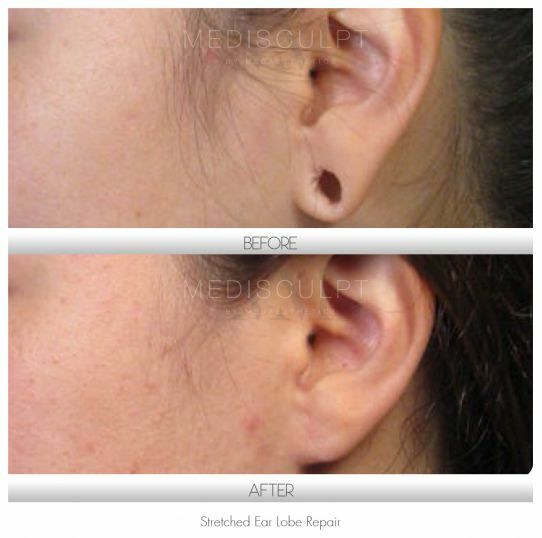 Earlobe repair is a comparatively minor surgical procedure. The local anaesthetic is injected with a very fine needle; once the area is numb, the process involves the removal of stretched or torn skin edges using radio-wave surgery or CO2 laser. Thereon, the skin is sutured together using delicate sutures and tissue glue. The emphasis of this procedure is on restoring the natural-looking shape of the earlobes. This procedure usually takes between 40 to 60 minutes to perform. Once the treatment area has been numbed, you will be unable to feel any pain. At Medaesthetics™ we make every effort to ensure that every procedure we perform entails minimal pain or discomfort. Most people tolerate this procedure exceptionally well. Patients can go home straight after the surgery and do not require prolonged post-surgical hospital admission or monitoring. In the majority of cases, the incision scars are barely noticeable and begin to fade quickly within a few weeks. At Medaesthetics™, we have the most extensive range of Fractional CO2 Lasers to help reduce any scarring, whether related to a surgery or trauma. At Medaesthetics, all procedures carried out under local anaesthesia are done using a minimal amount of local anaesthetic agent to ensure patient safety. Ensure that you avoid blood-thinning medication such as Nurofen, Aspirin, Heparin and Warfarin. Please discuss this with your General Practitioner in detail and make sure you are aware of any side effects of your current medication. The cost of earlobe repair surgery depends upon the extent of the damage. Small tear repair costs around $400 per earlobe, while repairing larger tears and stretched earlobes may cost up to $800 to $1,200 per side. In general, otoplasty surgery costs between $4,000 to $6,500.